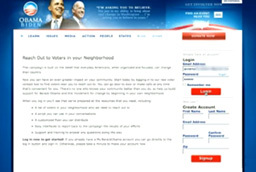 "allows you to find lists of voters either in your community or in key battleground state and print off call lists or make calls directly from your computer." 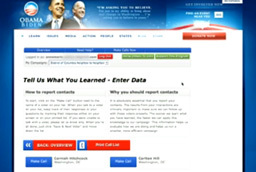 To begin go to your login screen and enter in your email address and password if you already have a My.BarackObama account. If you don't you can go down here to "create account" and enter in your user information. Click "login" to go to your dashboard. 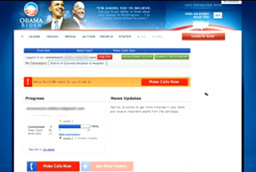 On your dashboard you will receive voters to call, any news updates, and a look at your progress screen. Click "make calls now" to get started. When you click "make calls" as you scroll down you will see that you are given a list of voters to contact either in your area or in a battleground state. You can either print off a call list by clicking here or you can click "make call" next to a voter's name to get started. 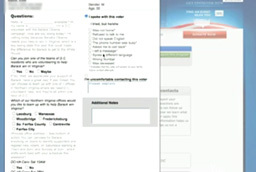 You can see that a script comes up with the voter's name, their phone number, and a list of questions for you to ask that voter. Make sure, when you're making calls, that you read through the script and become comfortable with it so you'll know what to say to voters on the phone... As you go along click on the corresponding dots to answer the questions that are on their script. When you're done calling you can make sure to select "save and close" to get back to your overview screen. 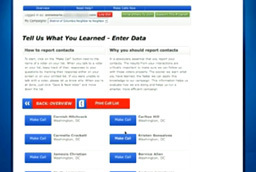 On the overview screen you will still have the same voter list if you have not contacted all of your voters. You can begin to make calls again, or if you printed off your call list you can log back in and click on "make call" next to the voter's name to enter in your results. It is absolutely essential you report your results from your conversations. They will be used to help the campaign be more effective in your area. At any time you can click on "back overview" to look at your overview screen, visit our help section or continue making calls.